Up to twenty-five people to participate in a week-long Theatre for Living workshop. No acting experience is necessary. Just a willingness to be honest about your experiences and a desire to play! 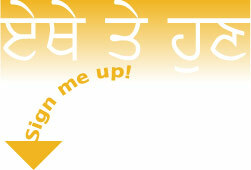 Participants should have a connection to the issues of violence in the Indo-Canadian community and want to do something about it. We need a diversity of perspectives from within the community to enrich this work. your perspective is valuable to this workshop! The workshop will use theatre games and exercises to build trust and explore your experiences around the issue. In the beginning, these games and exercises are non-verbal. Slowly, the workshop will create plays, based on the life experiences of the workshop participants. This will happen through a symbolic, physical language. Testimonials where you tell really personal stories to the group will not be asked from you. It is these points of tension that will form the subject matter of play. This workshop does not go to public performance. Its purpose is to gather the core material for the creation of the Forum Theatre production that will perform in Vancouver and Surrey. The workshop will take place from October 17-22, 2005, at the Moberly Arts & Cultural Centre - 7646 Prince Albert Street, (one block east of Fraser at 60th). It is very important that you are able to commit to coming to every day all day of the workshop. Each workshop participant will be paid $500.00 for the week and lunch will be provided each day. Five members of the community workshop will create the main-stage Forum Theatre play along with Headlines’ Artistic Director David Diamond and a professional design team. We don’t want the community workshop to be an audition so, if you want to be considered for the cast, you will be asked to do some improvisation work with David during the participant interviews. Cast will be paid $550 a week for the duration of the project (October 17 - December 11). Cast members will sign contracts stating they are available for the full time period and all performances. To become a workshop participant, please send us a letter/email/fax indicating that you are available to commit to the dates and times of the workshop (October 17 to 22 from 9am to 5pm each day). If you are interested in creating the public main-stage show and being a cast member, please indicate that you are available to do so. Here and Now will be created and performed by members of the community. It will be performed for the general public and be a way for diverse audiences to explore solutions to the issues of violence. The record of the audience interventions, in the form of initiatives that would enhance existing community organizations’ programs addressing the issues of violence, will be turned into a report. 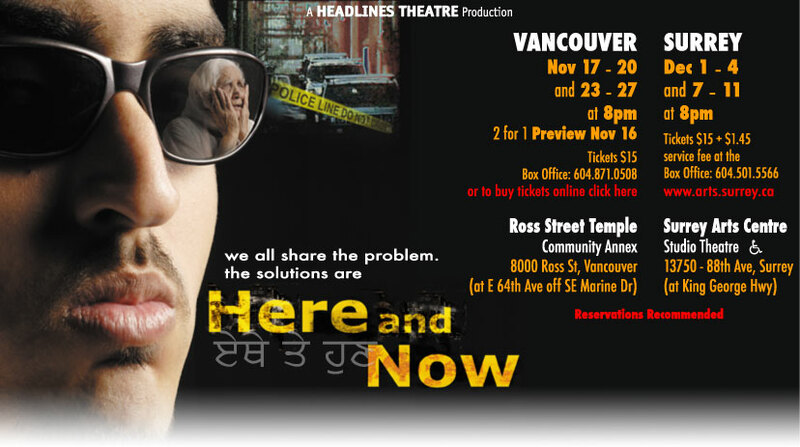 Here and Now webcast was broadcast live to the world wide web on December 11, 2005, from the Surrey Arts Centre. Thanks to everyone who logged on, watched live and participated with your unique interventions. Please specify whether or not you are interested in going on to create the main stage production or if you would like to be in the workshop only. We will gladly answer any questions. Please call 604-871-0508 if you would like to join. September 19 - 23, 2005 - Participant interviews and cast auditions. All participants will be interviewed, those interested in being in the play will audition. It is not possible to prepare for this, just bring yourself and be willing to play! September 30, 2005 - Final selections. October 17 - 22, 2005 - Workshop. The THEATRE FOR LIVING workshop will take place from 10 am - 6 pm each day. October 25 to November 15, 2005 - Rehearsals. (10 - 6 daily, Monday is day off) The cast creates the main stage production. November 16 to December 11, 2005 - Performances. The forum theatre production will be performed 19 times in two venues in Vancouver and Surrey. January 2006 - Community Action Report goes to social service agencies.